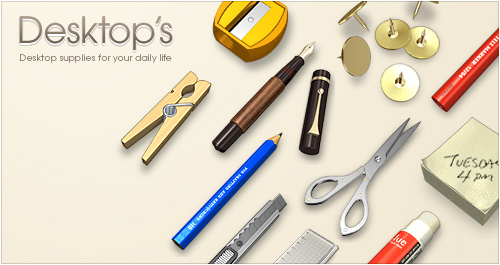 "Desktop's" is the photo-realistic icon set of various desktop supplies. Seventeen realistic icons such as a pencils, memopads, scissors, and grue sticks are contained in the set. The 3D models of the pencil and the scissors for this set were also used in the "mw". This looks very interesting. I wanted it for windows as well. oh, so good! i like the icons very much! Awesome set, the pens are just incredible! I tried several times to catch them by pitching my fingers on the screen before realizing it was just icons! I love the cutter too... Great work.